Objective: Explore angle relationships formed when two parallel lines are but by a transversal. Directions: For each example, look at the figure. Follow the steps listed below the figure and answer the questions asked. 1) Here, we observe two parallel lines f and g cut by segment EF. Click on point E and move it to the left and to the right. Observe the measures of angles EGB and FHC. What do you observe? 2) Based on what you learned in the flipped video assignment, make a conjecture (hypothesis) about the angle relationship demonstrated by angles EGB and FHC. 3) What are some other angles with measures congruent to EGB and FHC. Explain how you know. 1) Here we again observe two parallel lines cut by a transversal. Click on Point E and move it to the left and to the right. What do you observe about the sum of the measures of angles EGA and FHC? 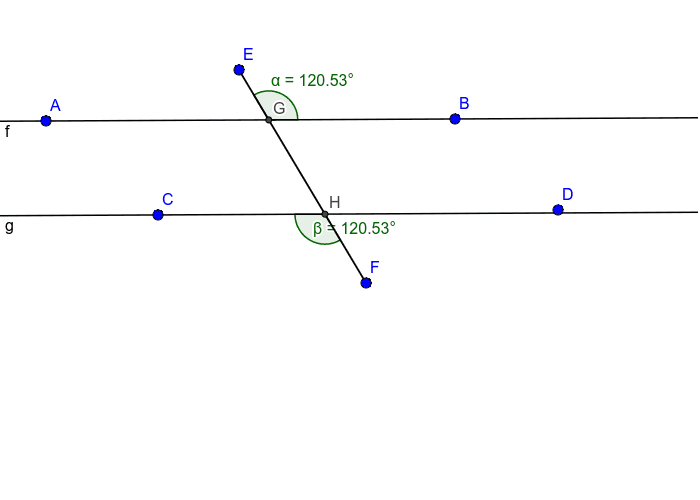 2) Based on what you learned in the flipped video assignment, make a conjecture about the angle relationship demonstrated by angles EGA and FHC. 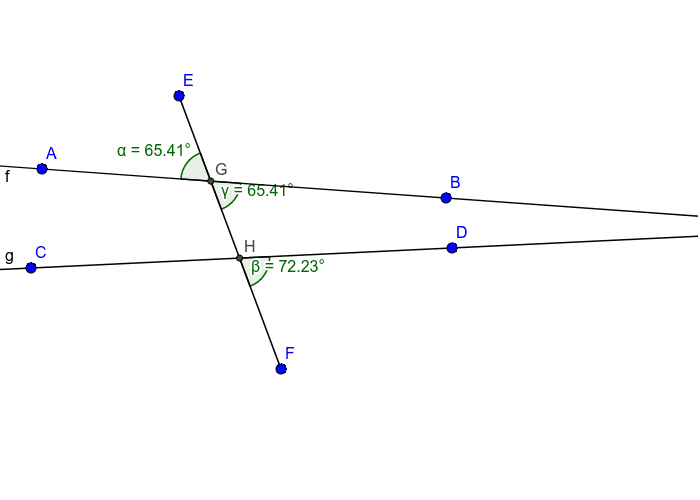 3) What are some other pairs of angles with the same relationship as angles EGA and FHC? Explain how you know. 4) When two parallel lines are cut by one transversal, how many total angle measures will there be in the entire figure, assuming no other lines or segments are present? 1) In this example, our two lines are not parallel. Drag Point E to the left and to the right as you have in the previous examples. What is different about this figure? How does it affect the observations you made in the previous examples? Be specific in your explanation. 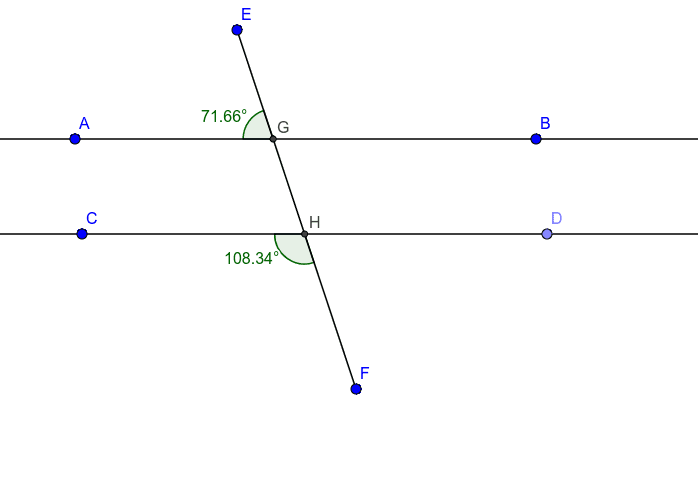 2) Look at angles BGH and EGA. Why do these angles remain congruent even though the two lines are not parallel? Make a specific distinction between the relationships observed in the first two figures and this figure.